The auction for my Still Life with Silver Pitcher, Two Strawberries, and Concord Grape (Live Demo Painting) ends today: Click to view auction - ends at 3pm EST today, Wed Nov 14. I also posted photos from the event on FB and instagram (I'll be adding more), and I invite you to watch the full recording of my live demo. If you enjoy this video, you may also like to see more of my live demo painting time lapse videos. 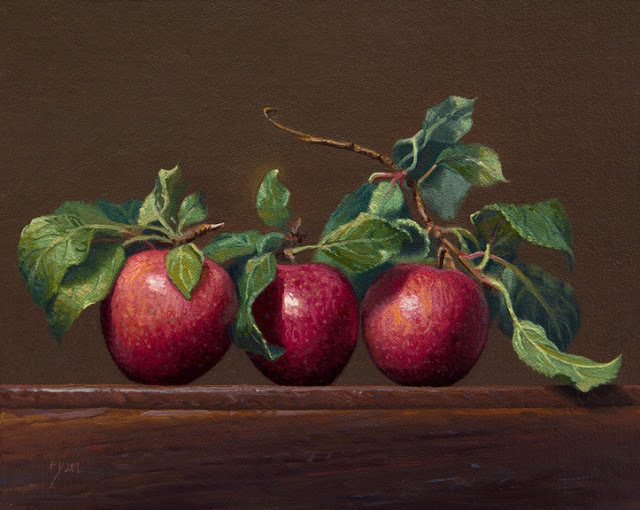 My 8x10 painting, Still Life of Leaves with Three Apples, is available as a SIGNED high quality 8x10 fine art limited edition print. The edition is limited to only eight (8) prints and there are 3 left. Purchase a print here.